You can send almost anything in this catalog to anyone ... anywhere in the U.S.
... or almost anywhere in the world ... see page 267 for complete details. members of same household should use same name each time they order. tion of the item-each time you order. rates and estimated motor freight rates) in our Big Book. 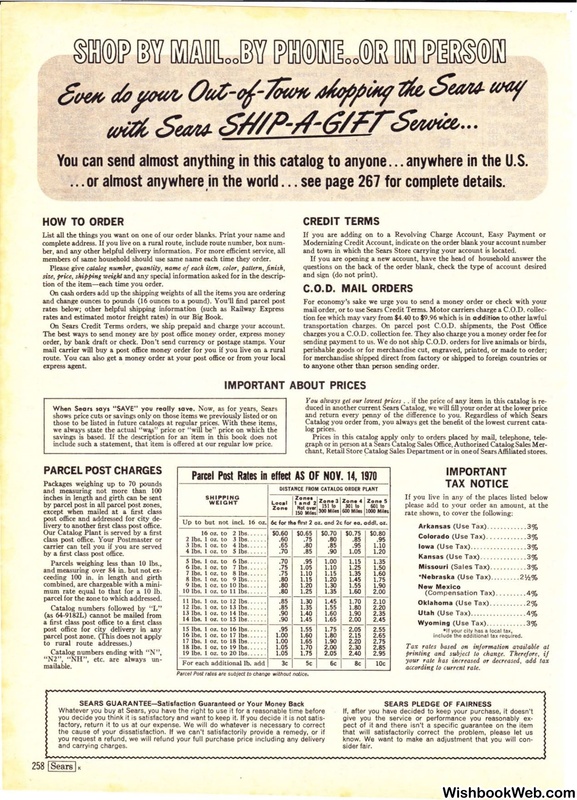 Sears Credit Terms orders, we ship prepaid and charge your account. and town in which the Sears Store carrying your account is located. and sign (do not print). to anyone other than person sending order. include such a statement, that item is offered at our regular low price. chant, Retail Store <:;atalog Sales Department or in one of Sears Affiliated stores. livery to another first class post office. by a first class post office. Up to but not incl. 16 oz. oz. and 2c for ea. addl. oz. mum rate equal to that for a 10 lb. parcel for the zone to whkh addressed. Catalog numbers followed by "L"
16 oz. to 2 lbs. 2 lbs. 1 oz. to 3 lbs. 3 lbs. 1 oz. to 4 lbs. .
4 lbs. 1 oz. to 5 lbs. 5 lbs. 1 oz. to 6 lbs. 6 lbs. 1 oz. to 7 lbs. 7 lbs. l oz. to 8 lbs. 8 lbs. l oz. to 9 lbs..
9 lbs. 1 oz. to 10 lbs . .
10 lbs. 1 oz. to 11 lbs . 11 lbs. 1 oz. to 12 lbs. 12 lbs. 1 oz. to 13 lbs. .
13 lbs. 1 oz. to 14 lbs. 14 lbs. 1 oz. to 15 lbs. 15 lbs. 1 oz. to 16 lbs. 16 lbs. 1 oz. to 17 lbs. .
17 lbs. 1 oz. to 18 lbs..
18 lbs. 1 oz. to 19 lbs. 19 lbs. 1 oz. to 20 lbs. •Nebraska (Use Tax) ..... . ..
Oklahoma (U se Tax). . .